Hypoallergenic Dog Shampoo, where can I find that? **these Hypoallergenic dog shampoo are thoroughly reviewed in this article. Like most dog owners, if your dog happen to be allergic, you wish it wasn’t. The term hypo-allergenic dog refers to those dogs in general that are allergic to some or the other substance. Normal dog shampoos cannot be used to bathes such dogs. They need more frequents baths and use of regular shampoo might be too harsh on their skin and coat. These shampoos are made to be extra mild and do not use any strong or harsh chemicals. They also leave out certain common ingredients that the pet may be allergic to. >>check out this link for more info<< these guys do a great job, at explaining this particular situation. This shampoo is the top on the list, because it is the most simple of all the other shampoo we are going to recommend here. Simple because the list of ingredient, is short (may I add sweet). Now you may think: – wait a minute, that’s a bad thing isn’t? The correct answer is actually no; this is excellent, because the less ingredient it contains, the less chance the dog is going to be allergic to them. Of course, the ingredients in this powerful shampoo are all organic, which decrease tremendously their chance of being bad for the dog. Apart from the fact that it is Tearless & soap free, or it moisturizes and all other advantages it has, the thing we like the most, is that it will not affect topical flea control products from doing their job. In second place we have Tropiclean, with their shampoo that is first intended for puppies!! We made a previews article weeks ago about puppy shampoos, and the last phrase was ” Keep in mind that these shampoos can also be use on grown dogs that happen to have a really sensitive skin.”. While that statements was correct, in a hypoallergenic dog shampoo, they are certain key ingredient that are needed, and This shampoo have them. The most important ingredient in this product is the Avena sativa. Which first of all is a beautiful name, but don’t get fool it is also known as Oat. Oats are so rich, they are packed full with a lot of healthy things–including calcium, starch, iron, alkaloid, flavonoids, B vitamins, saponins and amino acids such as methionine and lysine. When you talking about Organic shampoo that are on the market, the Earthbath brand always comes up. 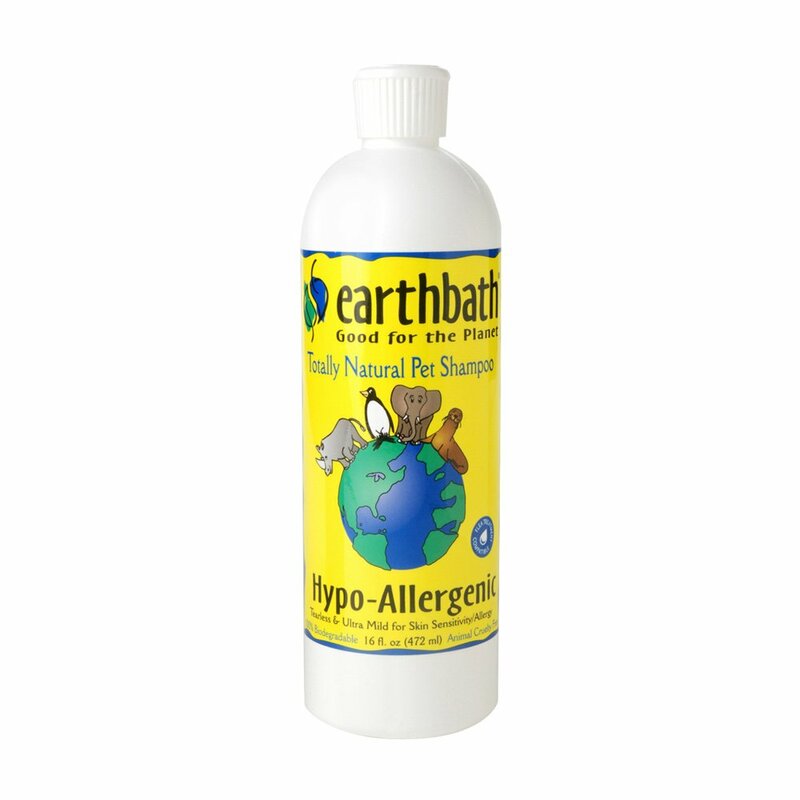 Same thing with Hypoallergenic dog shampoo, Earthbath created an excellent one. But why are they only number three on this list, you may wonder, well it is simple: this shampoo does not have vitamin E.
The cool thing about this shampoo though, and all the Earthbath line of dog shampoos, is that they are 100% bio-degradable, and that is the reason they product are constantly on top. info about this subject for a while and yours is the greatest I have came upon so far. Thank you for helping out, good info. I certainly love reading everything that is written on your site.Keep the stories coming. Extremely useful info specially the closing section 🙂 I deal with such info much. I was seeking this particular information for a long time. Thanks and good luck. know how to make your site mobile friendly? My blog looks weird when viewing from my apple iphone. Some really superb articles on this web site, appreciate it for contribution.